Salmon fillet, coated with a honey-mustard sauce, and grilled to perfection on top of a cedar plank — this is by far one of my favorite recipes. In fact, this is my go-to Sunday supper. It’s super easy, definitely delicious, and is best paired with nicely chilled rosé. My favorite thing to do with this salmon is to plop in on top of a ginormous salad and enjoy with some fresh baked bread. Unfortunately, that’s not photogenic, but sometimes the best meals just aren’t. And that’s ok. This meal will never plate pretty. Too bad. Looking for the perfect wine pairing? For a hot summer day or for those who are looking for a light wine, I highly recommend Toad Hollow Rosé. For those looking for a red wine, I recommend something that will accentuate the cedar, such as Hitching Post’s Pinot Noir. Side Note: I’ve got an Orange Glaze that would work well with this exact same cooking method (you know, if you want to change it up). Soak the cedar plank for at least 30 minutes prior to use. Once the plank has been soaked and grill is preheated, place the prepared plank onto the grill. Preheat plank for about 5 minutes. Combine the honey, mustard, and balsamic in a small bowl and whisk with a fork until thoroughly combined. Place the prepared salmon fillets on a clean plate or cutting board. Generously brush the salmon fillets with about half of the sauce. There will be spill-over. That's ok.
Flip the preheated plank over. 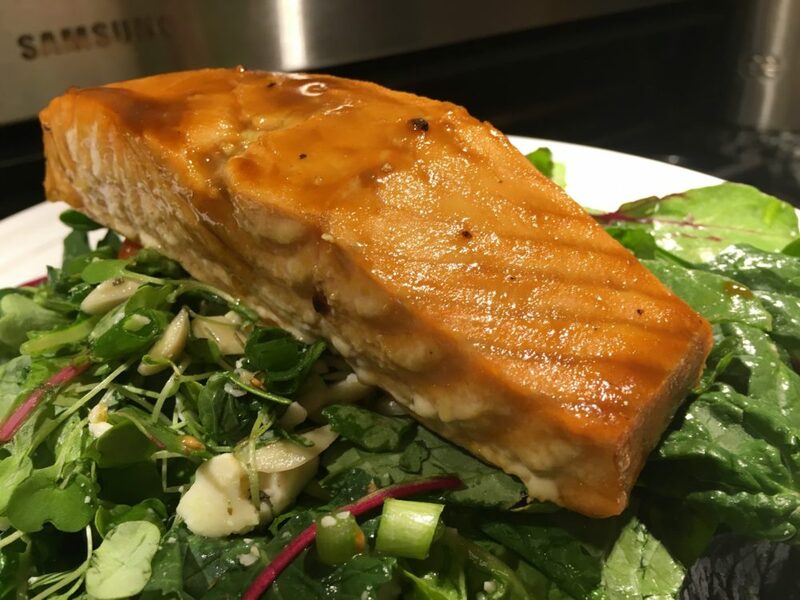 Place the glazed salmon fillets on the hot plank, glazed side down. Generously coat the salmon with the remaining sauce. Again, there will be some spill-over. Close the lid of the grill and cook for 8 to 10 minutes or until salmon has reached desired amount of doneness. Use tongs to remove the salmon fillets from the grill and onto serving plate.